Home » Frequently Asked Questions » How Long Is Bartending School? How Long Is Bartending School? So you’re interested in bartending school and certification, but you have some questions. Naturally, the first question you have is, how long is bartending school? How long will you have to wait before you can start applying for jobs? This is a good question. A great many people wish to complete school as quickly as possible. Still others are looking for a good part-time program, that is easily adaptable to their lives. National Bartending School has both! If you put your all into it, bartending school can be done in as little as two weeks. If you need to space out your classes, you have up to one year to complete the course. The amount of time it takes to finish bartending school is completely up to the individual student. You are free to schedule classes around work, childcare, and other schooling- the sky is the limit with National Bartending School! The state of California requires 40 hours of class curriculum to obtain your bartending license. These 40 hours are broken down into two hour classes, each one covering one of ten chapters. Every class is divided into two parts; one hour of lecture and one hour of lab time behind the bar. Our mock bar has room for several students to work at a time, so space is always available and class size is never an issue. In order to be eligible for testing, students must attend at least one class for every chapter in the textbook. The school offers classes six days per week, up to three times per day. Most campuses are closed Sundays. Testing consists of a written and practical exam, taken once the student has completed their 40 hours of class time. The written test is a comprehensive exam on everything covered during the class. In the practical exam, you will be required to mix a certain amount of drinks in a set amount of time. Once you have passed both tests successfully, you will obtain your certification. Testing is available for scheduling every week, so once your classes are complete, you won’t have to wait long for certification! Prior to testing, students can request that instructors give them practice tests, to prepare them for the final exam. This can be done a multitude of times, to make sure you are ready. National Bartending School offers classes up to three times per day, Monday through Saturday.. Students are also encouraged to log class hours in the bar in between scheduled classes, where you can go to study, mix drinks, and practice your speed. Lab hours count towards your overall class time. You can also schedule practice tests during this time. It is wise to take advantage of extra practice time, to help prepare you for the practical exam, and employment in a bar.. Flexible schedules are always available at National Bartending School. Earning a bartending license in as little as two weeks is possible when attending full time. Many of our campuses offer classes three times a day Monday through Friday, and two classes on Saturday. You can complete your classes and testing in under two weeks at a campus like this, if you attend every day. Earning your certification doesn’t take long if you’re dedicated to full time attendance! Some students prefer to take their time, out of necessity. Oftentimes, for one reason or another, people can only attend a few classes per week- and that’s perfectly fine! We at National Bartending School strive to make bartending classes work for your busy schedule. Your success is important- we want you to choose our school because the classes fit your lifestyle. A flexible schedule assures that our students will have the easiest time graduating. The only hard and fast rule is that classes must be completed within one year of enrollment. Give Us A Call, We’re Waiting For You! You’re looking for a new career, and National Bartending School is here to get you prepared! We have the curriculum for you, whether you want to finish school quickly, or take your time! National Bartending School is here to help you achieve your goals, obtain your certification, and find a job in this great industry! We are proud of our students, and encourage you to make school work for you! Contact us today! Does Bartending School Help You Get A Job? Should I Go To An Online Bartending School? How Long Does It Take To Get My Bartender Certification? 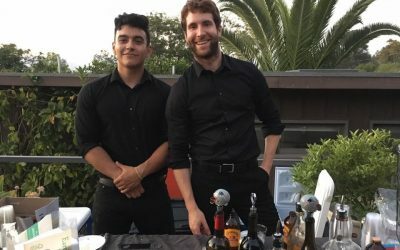 How Much Does It Cost to Hire a Bartender for a Private Party? How much does bartending school cost?